Credit: X-ray: NASA/UIUC/Y. Chu & R. Gruendl et al. Optical: SDSU/MLO/Y. Chu et al. Massive stars lead short, spectacular lives. 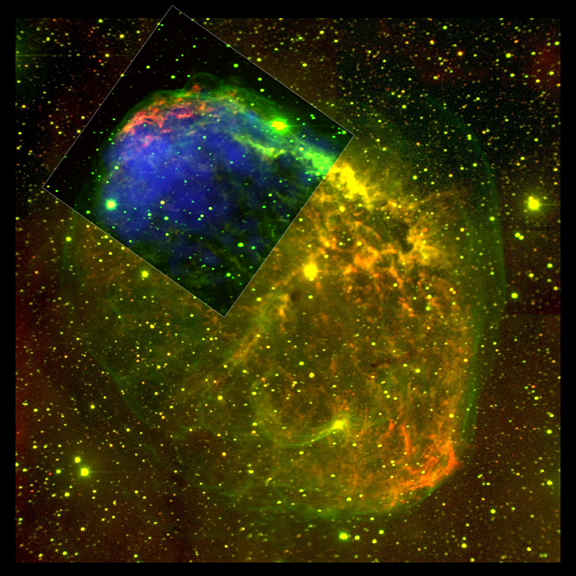 This composite X-ray (blue)/optical (red and green) image reveals dramatic details of a portion of the Crescent Nebula, a giant gaseous shell created by powerful winds blowing from the massive star HD 192163 (a.k.a. WR 136, the star is out of the field of view to the lower right). After only 4.5 million years (one-thousandth the age of the Sun), HD 192163 began its headlong rush toward a supernova catastrophe. First it expanded enormously to become a red giant and ejected its outer layers at about 20,000 miles per hour. Two hundred thousand years later - a blink of the eye in the life of a normal star - the intense radiation from the exposed hot, inner layer of the star began pushing gas away at speeds in excess of 3 million miles per hour! When this high speed "stellar wind" rammed into the slower red giant wind, a dense shell was formed. In the image, a portion of the shell is shown in red. The force of the collision created two shock waves: one that moved outward from the dense shell to create the green filamentary structure, and one that moved inward to produce a bubble of million degree Celsius X-ray emitting gas (blue). The brightest X-ray emission is near the densest part of the compressed shell of gas, indicating that the hot gas is evaporating matter from the shell. The massive star HD 192183 that has produced the nebula appears as the bright dot at the center of the full-field image. 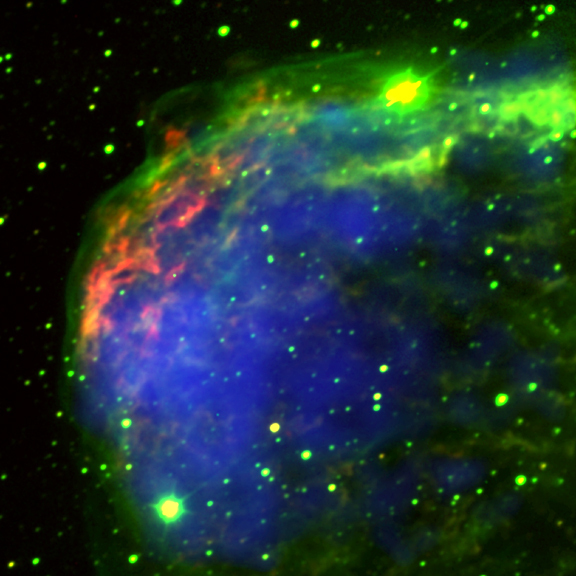 HD 192163 will likely explode as a supernova in about a hundred thousand years. This image enables astronomers to determine the mass, energy, and composition of the gaseous shell around this pre-supernova star. An understanding of such environments provides important data for interpreting observations of supernovas and their remnants. Credit X-ray: NASA/UIUC/Y. Chu & R. Gruendl et al. Optical: SDSU/MLO/Y. Chu et al. Scale Image is 8.2 arcmin per side. Coordinates (J2000) RA 20h 12m 35.00s | Dec +38° 26' 30.00"